Along the way, he added another “first” for his Torrence Racing/Capco Contractors team by advancing to the title round for the second consecutive event. 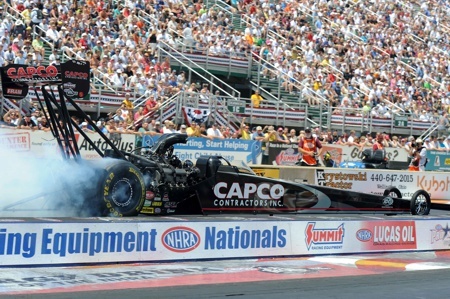 Along the way, he also defeated 10-time champion Tony Schumacher in the semifinals. Torrence was runner-up a week ago in Joliet, Ill. and continues to provide evidence that his team is one to be reckoned with as the season rolls toward the final six Countdown to the Championship races. He has been a finalist in four of the last six races, winning twice. In this title showdown, Spencer Massey left the starting line first and Torrence came within a few ticks of capturing a comeback victory. The winning elapsed time was 3.916 seconds at 312.60 mph to his 3.894 at 315.71, a margin of .0026 second. “We had a great day. We just got beat,” commented Torrence. “I wasn’t on my (starting line) game. I missed it a little bit, but I lost on a hole-shot . . . and I hate losing on a hole-shot more than anything! Torrence began eliminations by beating Brandon Bernstein – 3.837 at 318.17 to 4.570 at 169.25 – and he followed with a decision over newcomer Keith Murt – 3.880 at 315.42 to 4.214 at 226.39. In his semifinal match, Schumacher’s car smoked the tires early and Torrence got the win light with a 3.900 at 312.50 to a 9.186 at 69.74. The race win pushed Massey into the Full Throttle series points lead with 984. Schumacher is second with 955 and Torrence remained fourth with 877. He’s now 64 points behind third-place Antron Brown’s 941. “We plan to test at Norwalk on Monday and then we’ll get ready for the Western Swing that starts in two weeks,” he said. NHRA’ s traditional three races in three weeks grind begins in Denver July 20-22 and moves to Sonoma, Calif. July 27-29 before concluding in Seattle, Aug 3-5.